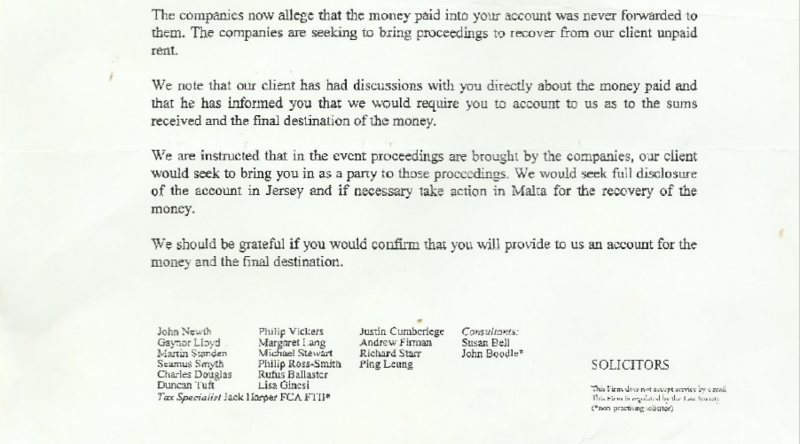 This faxed letter to Adrian Delia from a London firm of solicitors is self-explanatory. I have removed the name of their client (who is Maltese) who paid around £1 million in “rent for a number of London properties” into Adrian Delia’s account with Barclays International in Jersey over the course of “three or four years”, at the rate of £20,000 a month – at a time when £20,000 was a lot more than it is today. I have also removed the names of the two companies, incorporated in the Marshall Islands (a secretive offshore jurisdiction) to which Dr Delia was meant to transfer the money which was processed through his Jersey bank account. 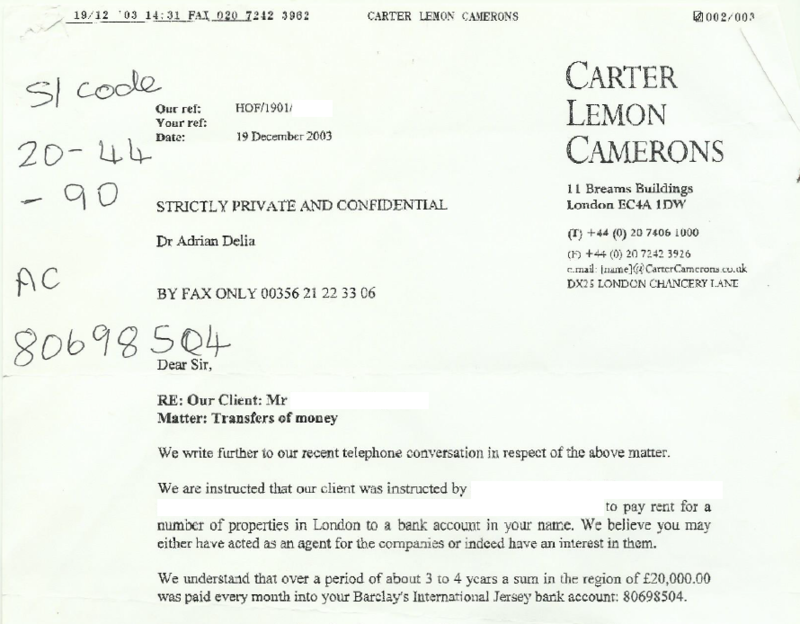 The London solicitor’s client is claiming here that Dr Delia did not pass on the money which was only meant to be processed through his account. The “rents” are not actual rent at all, but a fixed, large daily sum taken from prostitutes working out of what are known as ‘walk-ups’ in Soho and Shepherd Market, London. To circumvent the law that makes living off the proceeds of prostitution a crime, the daily cut is called ‘rent’. And to circumvent the law against running a brothel, only one girl works out of each flat at any given time, because two or more constitutes a brothel under UK law. The flats are owned by Maltese landlords. This website has the addresses. This is by no means the full story, as there is far more. But in view of Adrian Delia’s publicity stunt outside the Courts of Justice this morning – and bearing in mind that he is an officer of the court fully intending to lie to it just as he has lied to his aides, the press and the public on this matter – I felt it necessary to publish this letter immediately with the most basic explanation.